It is a scary article: though mostly focused on the United States, it touches on a phenomenon that is affecting most countries, where the problem seems to be getting worse, fast. The accountancy firms, of course, take this problem and inject steroids. It’s not just market power in their own industry that’s a problem: through the tax (and other) shenanigans that they design and market for their multinational clients, they transmit this problem to all other sectors: far beyond their own areas of audit and accountancy. The fact that they have unusually concentrated power in their own market – see below – makes this worse still. “Although presenting as “the guardians of commerce” they are unregulated and unaccountable; they have infiltrated governments at every level and should be broken up. These four global behemoths, which employ 800,000 people and are expected to enjoy revenues of $130 billion this year, are arguably the greatest vectors for tax injustice the world has ever seen. So how big is the problem, in terms of market power? 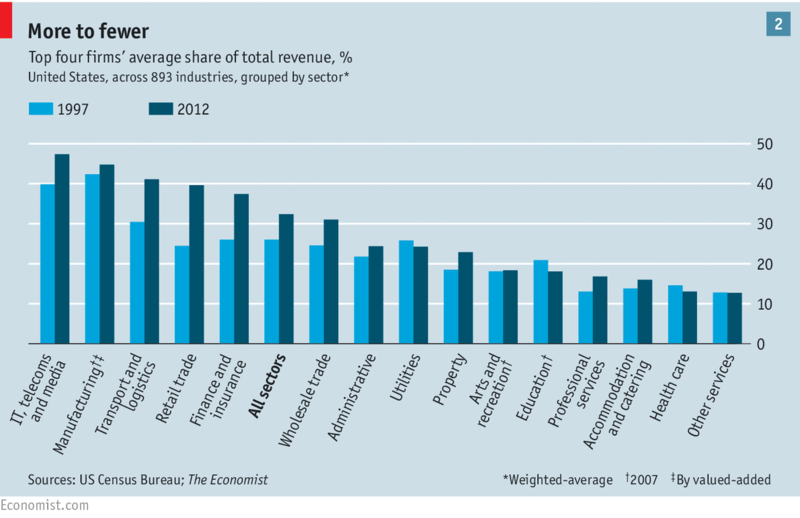 Well, The Economist has a graph showing that the top four firms’ average share of total revenue, with market share rising to shocking levels, nearly 50 percent for technology firms. Ponder that statistic for a moment. Does anyone think this state of affairs is remotely healthy? As Nicholas Shaxson, author of “Treasure Islands”, the bestselling work on tax havens, told us over the weekend, “Like the too-big-to-fail banks, they pose multiple threats to our societies”. Break ’em up. This, alone, is worthy of a major global campaign. I agree that the big 4 pose a threat if not broken up. This can be especially seen in the recent Taylor Bean case. In that case where their client went bankrupt, PwC got exposed for how they are able to get away with performing limited audit procedures while they are being paid millions to perform detailed audit procedures. The only reason they get away with doing that routinely is because they are part of a comfy oligopoly.